Protein is a highly important aspect of our diet. This contains ‘amino acids’ which are the ‘building blocks’ of protein that together build our flesh and our other tissue. Most of this protein comes from animals – they are made from the precise same amino acid building blocks as we are, so all that happens here is that our body is processing the muscles and flesh of the animals and then using that to build our own. Particularly in the case of protein, the old adage that you ‘are what you eat’ very much rings true. But if this is the case, the question then is – how do vegetarians avoid falling completely apart? Well the reason for this is that they are able to get their protein from other sources and specifically plant sources. Vegetables, nuts and seeds all contain a certain amount of protein which gives them their consistency and allows them to grow and build the tissue that they use. The question that vegetarians need to ask themselves though, is whether this plant protein can be considered as beneficial and as useful as animal protein in building human tissue and muscle. Here we will look at what the differences are between them and whether plant protein is as effective as animal protein. Rather than beat about the bush, let’s get right down to it. Is plant protein as good as animal protein? The simple answer is no. There are many reasons for this, and these fall under a number of categories which we will look at here. Grams: Quite simply the amount of protein in animal sources is greater when compared to the amount in plant sources. Animals weigh more and as such you are getting more dense protein to use in your body. In order to get a similar amount of protein from plants you’d have to eat a huge amount of vegetables and that would end up causing you gas problems. Amino Acid Profile: The amino acid profile of a food source refers to the number of amino acids it contains. There are roughly a total of 27 amino acids, and those foods that contain all 27 are called ‘complete’ sources of protein. The only food sources that are genuinely complete are eggs (yolk and white combined) and soy beans. Soy beans yes are a plant source, but they are the only plant source that contains anywhere near as many amino acids as the various animal sources. If you eat beans, mushrooms, or broccoli then you simply won’t be getting as many amino acids as you would get from chicken, pork or beef. And this is a big problem because each amino acid is used for a different job in the body. 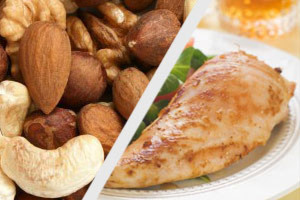 Indispensable Amino Acids: Indispensable amino acids are the ones that we need in our diet, whereas dispensable amino acids are those that we do not and that the body is capable of producing itself. In order to make the best use of proteins the body needs more of these IAAs than the DAAs so that they are easier to sift through. If a protein source has lots of DAAs and only a few IAAs, then some of those IAAs will be missed and wasted and more energy will be wasted converting the protein. Plant sources have the balance all wrong and so are less ‘bioavailable’ than meat sources which are already in the right ‘format’ as it were to be used around the body. BCAAs: BCAAs are ‘branch chained amino acids’. These are amino acids which are in a more complicated form – joined together in particular structures. These are relevant because they mean that the protein is already partially in the form of the muscle, the flesh, or whatever else it is being used for. Again then it is less energy and less effort for the body to convert the correct BCAAs into human tissue. Other Nutrients: What we also have to remember is that meat sources of protein aren’t only good for their protein. They’re equally important for things like vitamin B12 which we can’t get from plant sources. This vitamin is crucial for our nerve health and for the function of our brains, and without it we would find ourselves developing a number of serious problems. In short, we evolved to be omnivorous and this is what our bodies are designed for. There is a reason we don’t eat only plant protein and that’s because it doesn’t contain all of the nutrients our body needs in the correct format. If you do choose to become a vegan vegetarian, then make sure that you are aware of this and that you heavily supplement your diet accordingly. You conveniently leave out the excess fat and cholesterol found in animal proteins. Why is that? Very one-sided, leads me to believe you have an agenda, since you leave out all the benefits of plant proteins. Read The China Study, as well as works by John McDougall, or watch Forks over Knives. Be sure to bring an open mind when you look at these. What did you draw these false conclusions from? Are you actually using research from a source newer than the 1950's? The information about Protein < -> Amino Acids breakdown and reconstruction is scientifically outdated. This is way too one sided. Plant based proteins contain way more phytonutrients, vitamins and minerals then animal based proteins. They also contain a WAY better ratio of Omega 3 and Omega 6 acids as compared to saturated fats in animal based proteins and are LOADS better for you if you want to prevent heart disease. They also keep your body's PH more leveled then animal based proteins. Animal proteins also have a higher concentration of sulphur containing amino acids that get metabolized to acid-generating metabolites. If you think like the poster in the blog. You will probably have a higher chance of heart disease and be generally less healthy then someone who is more informed. And you will probably not get enough plant based nutrients in your diets. Like antioxidants that animal proteins do not have. Can you please provide a reference saying that we 'evolved' to be omnivores/eat meat? Where is the science backing up this article? You don't state any studies, Just opinion. BCAA? WTF? WHERE do you get this from? Why don't you read and get some education about what you are saying. The body doesn't absorb proteins, it absorbs only amino acids… individual amino acids. Animal protein cannot be digested without satiated fat, cholesterol, toxins, added chemicals, artificial hormones, fattening antibiotics, toxic bacteria and more. Vegetable protein doesn't have any of this plus it comes with vitamin, nutrients, antioxidants, fiber, other phytochemicals. This article is totally skewed & does not share all the positive health benefits of choosing a plant based diet over eating other living beings. Amino acids or not, it has been proven that a vegetarian & vegan diet provide you with much fewer health concerns than those eating a diet of corpses. They should have included pics of meat eaters vs plant eaters. Lol. Then you'd see the difference! !